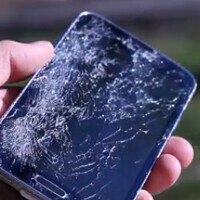 Smartphone insurer SquareTrade has given the Samsung Galaxy S5 a 6 for its Breakability Score. A lower score is considered more desirable. This means that the insurer sees Samsung's latest flagship model as being more likely to survive an accident than its predecessor. The Samsung Galaxy S4 was rated a 7 when it launched last year. This dovetails with a recent video of a drop test we passed along that showed the Galaxy S5 screen surviving a drop that the Galaxy S4 display could not.